Hostal El Portal is a friendly property located in Semuc Champey. The property is run by Guatemalan owners and local staff. Our main objective is to offer the best of your trip to this paradisiac place in the green forest of Guatemala. 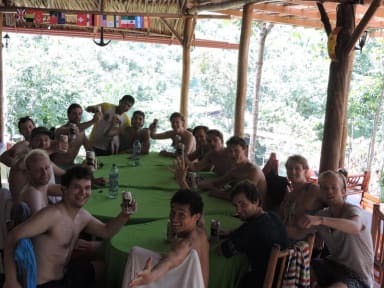 At Hostal El Portal, we are enthusiastic people with the desire to carry out this project and at the same time offer them a first class service. There is a 24-hour front desk, onsite restaurant, bar with national and international drinks and trips/tours can be organized. For more information, please do not hesitate to contact us. 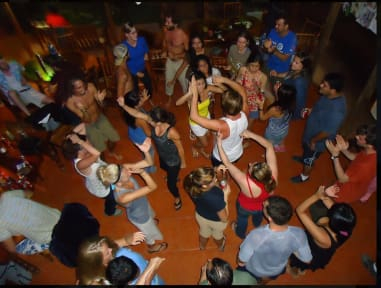 The hostel is located 73km north-east from Cobán and only 9km from Lanquin. The property is ideally located just few meters away from Semuc Champey Park. Hostal El Portal offers comfortable and spacious rooms (private and shared) some with private bathroom. Bed linen and towels are provided (in private rooms) and the following furniture: desk, night table, shelves, garbage dumps. Amazing hostel! 3 min walk from Semuc Champey's entrance. The vibe was very nice and laidback, food was good. Staff is super friendly and eager to help. Dorms are comfortable, clean. Nothing negative to say. Would definitely stay again! The room was clean and the staff very friendly and polite. However, the menu of the rancho is completely made for tourists as if it was an amusement park and, taking into account there was no other place we could eat, we missed having real food/dishes from the area. Beautiful place right next to the entrance of the park, which we liked as it meant only having to do the long, bumpy journey there once each way. Not so ideal if you want to spend any time in Lanquin. El Portal is incredibly peaceful and relaxed, with a good menu (catering well to vegetarians), that we considered a pretty reasonable price. Great staff, The room was cute and rustic, but very open (just an opening for a window) so the mosquito net provided seemed essential! This is a nice hostel resort style accommodation the location is fantastic and very clean. We found that the staff were really friendly, and the pool was nice with a great view of the river. We felt that the main area for improvement was the restaurant. The quality of food was well below what we expected for the price. 65Q for a piece of chicken, spaghetti & carrot is ridiculously unreasonable. This is only exaggerated by the hostels rule of no outside food. Improve the menu or lower the price. The best location, and it's the biggest selling point. Food was satisfactory and over priced, multiple people got food poisoning. NO WIFI at all. Not many areas to hangout or meet people. Staff always cleaning and remembered everyone's names. About a 2 min walk to Semuc Champey, and vendors selling cheaper and delicious food by the main entrance. You can easily see everything to want to in one day here. No lockers. Only one room key for the whole dorm. Great location for Semuc Champey but far from Lanquin. The room is very open to wildlife. Would advise doing 1 night here and then switch to Oasis for the second night. No WiFi at El Portal. El Portal is a beautiful place to stay due to the location on the river though it is a tourist trap, much like most of the other 'hostels' in Semuc. When we were checking out we found out that drinks from other guests (totalling to 350Q) had been added to our tab from the night before. We attempted to talk to the staff about the mistake but they treated us very rudely, saying I had 'forgotten' the purchases, forcing us to pay. We left El Portal feeling manipulated and taken advantage of.